Chester County decision makers envision the Chester Valley Trail to cross over or under the Exton Bypass to bring it into Downington. That vision is a long way off. But now new information posted on Google Maps shows an interesting if circuitous route for those who don't mind switching between trails and roads. The connection is possible via the emerging Uwchlan Trail - currently a somewhat disconnected patchwork of sidepaths that occasionally swing into the woods. Many of the street segments appear to be bikeable, although crossing Route 100 can be difficult. 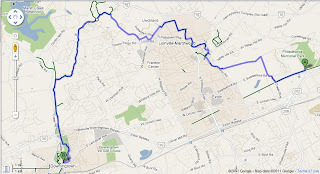 Uwchlan township plans to connect the segments and link up with the Chester Valley Trail via the developing Exton Park Trail network. The 32 year old Struble Trail is the final leg of the route and is quite scenic. 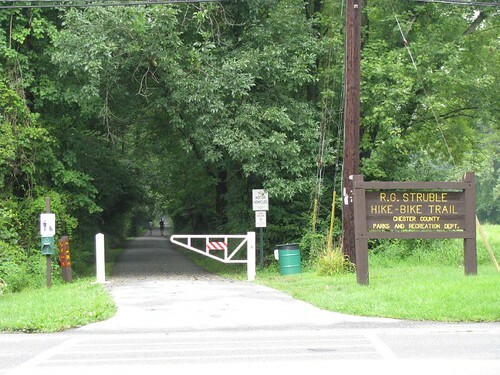 There are future plans to extend the trail along the Brandywine Creek to Honeybrook but the County's priority is completing the Schuylkill River and Chester Valley Trails so we may have to find a champion to really push for the extension. Here is the new and improved route that totally avoids Ship Rd and takes you to the Downington SEPTA/Amtrak Station.